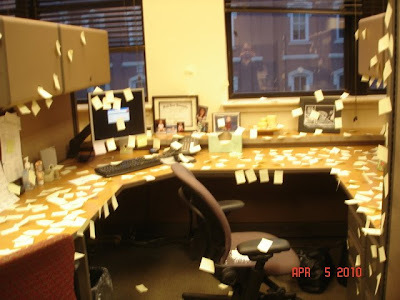 I love to play jokes on people at work, especially on April fools. I have put "Use other door" signs up on all the doors, I have rigged chairs to practically collapse when sat on, I have left messages for people to call a number (a morg.) and ask for "Myra Maines", I've turned up the volume on peoples' phones and speakers to the max, and on and on. I really had it coming to me. So this April fools I hadn't pranked anyone all day. Remember Ian was sick. So finally at the end of the night, I got Aaron's toothbrush ready for him. I never do that, so that should have been a sign. I used baby's Oragel (the gum numbing gel) on Aaron's toothbrush. It was really funny because he paused in the middle of brushing his teeth and said he had this weird numbing feeling. I laughed my head off and he just kind of shrugged his shoulders, like oh well when I told him what I did. He isn't that fun to prank. I really love pranks. My friend's dad used to play the best pranks on his kids for April fools. One year he sewed the kids into their beds. How does one do that you ask? Well he snuck in while they slept and sewed their pajamas to their sheets. Too funny! They couldn't get out of bed. I love it! By the way, if anyone knows, is it spelled "sewed" or "sowed"?